The mixing of print-quality graphics and molecular structure data has been a thorn in the side of cheminformatics for a long time, and for most workflows lacks a satisfactory solution. Indeed, for anyone creating documents with embedded graphics, it is usually tempting to use a bitmapped format (e.g. PNG), since these are supported universally. The catch is that if you take a bitmap that is sized for viewing on a normal screen, the document will look great, until you print it or turn it into a PDF, which tends to produce results that are nothing short of horrible. The solution is to use vector graphics whenever possible, and this is always the way to go for chemical structures, since they are made up of lines and curves that are already in the correct format. But the standardisation situation is utterly grim: the most standard is SVG (scalable vector graphics), but support from mainstream software is almost nonexistent, and for offbeat software tends to be shoddy. EPS (encapsulated postscript) is well supported by software from Apple, and by high end printing software that you can’t afford. WMF/EMF/EMF+ are Microsoft’s legacy formats which work well in the Windows ecosystem, but they have a lot of faults. They all render well when printed, but only EMF+ renders well onscreen, and non-Microsoft support for this class tends to not include the only good one (because the internals are nasty: I know, I’ve been there). Microsoft’s newer format for the XML versions of Office are based on something called DrawingML, which is somewhat like SVG, except unnecessarily overcomplex: nonetheless, it is surprisingly well documented. While it is unfortunately not possible to create a DrawingML document as a separate file (or rather, not possible to do anything with it), it is possible to create a Microsoft Word/Excel/PowerPoint document using open standards, and code it all up on a platform that uses exactly zero software from Microsoft. This is exciting and important, because it provides a way to move between silos, i.e. using software running in the Apple/Android/Java/Linux ecosystems to generate documents for Windows+Office users. 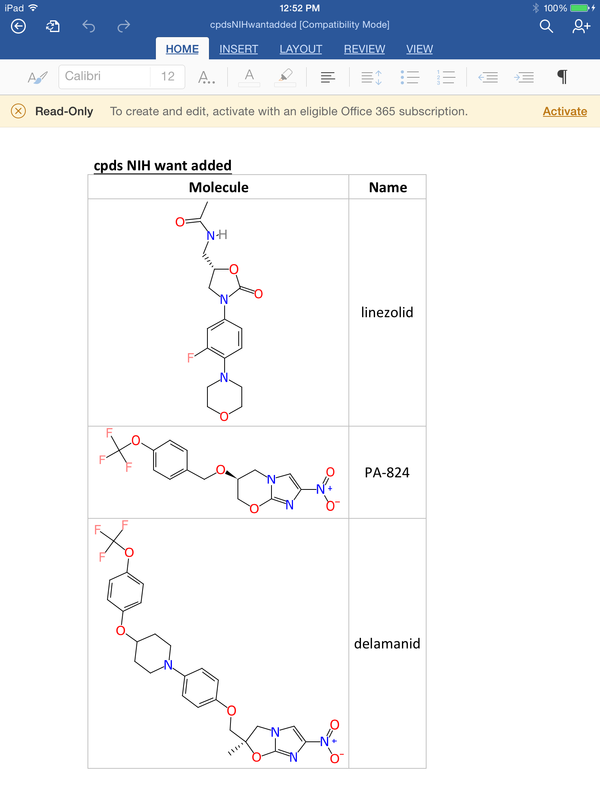 For awhile now it has been possible to use apps like the Mobile Molecular DataSheet (MMDS) and SAR Table to create documents with tables of structures and data, such that the structure diagrams render to the maximum capabilities of the screen and likewise when printed or rendered in a pre-print format like PDF. Unfortunately most of the software applications that can import Microsoft’s office formats fail to render the embedded vector graphics at all, and so the only way to make use of this content was by using the official Windows-based product. But now there’s an app that can open and view the graphics properly. The free version only provides read-only access, but that’s good enough to see that it works!